I signed up to make treats for what basically equates to a bake donation drive at PAX this year and given the recent heat, I decided to make something that didn't require the oven. Also, who doesn't want to relive their childhood cereal addictions? 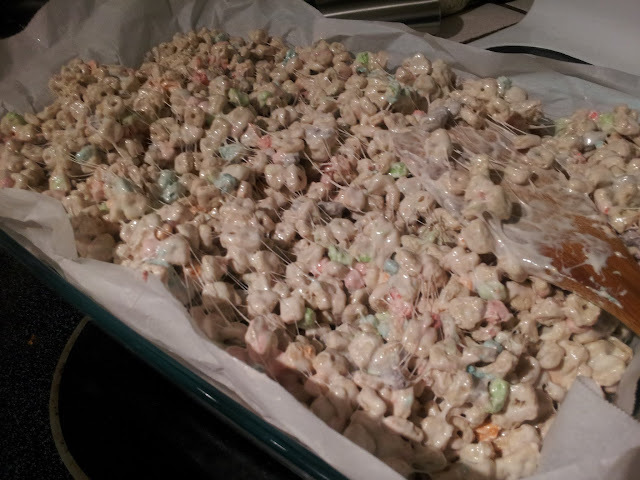 I found a basic Rice Krispys Treat recipe (1/4 cup butter, 10z mini marshmallows, 6 cups cereal) and just started going to town with some childhood favorite cereals. 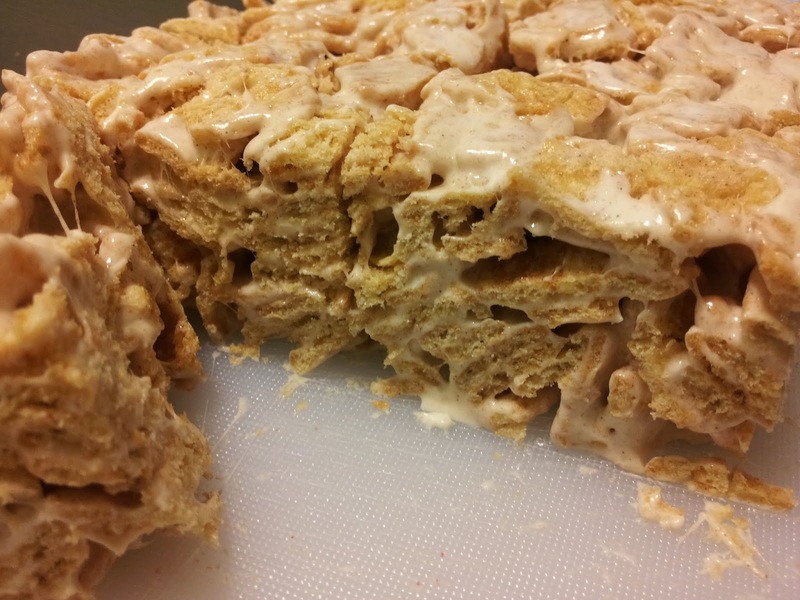 For those that are recipe challenged, I present a tutorial in Cereal Marshmallow Treats. Enjoy. Picking your cereal... This is an important part. The most important part. This will make or break your snack. Choose wisely. The cereal to marshmallow ratio will depend on which type of cereal you pick. I've learned that cereal with smaller pieces (eg. Fruity Pebbles) tends to take more marshmallows, while large piece cereal (eg. Cinnamon Toast Crunch) tends to take less. It all has to do with surface area and science, I assure you. Another fun fact is that cereal that's a different color than the marshmallows tends to be a bit more appealing in treat form. 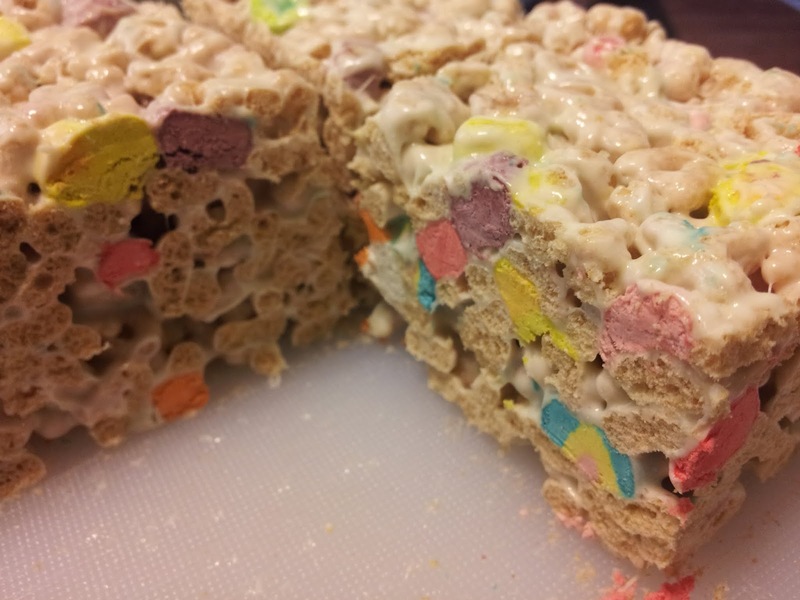 For example, Lucky Charms' cereal bits are almost exactly the same color as the 'mallows, which.. looks a bit like a giant glop of marshmallow in treat form. I recommend going for something with some amount of color, even if it is just tan. Lucky Charms isn't all that bad, though.. Check out that Rainbow! Funnily enough, the generic brand tends to run about 1 serving under the name brand cereal. A one serving difference doesn't make that big of a change, though, so don't sweat it if you're a little off from my ratios. Also, feel free to double or triple the recipe as needed. This really is a great snack to experiment with, so feel free to live on the wild side and get creative. 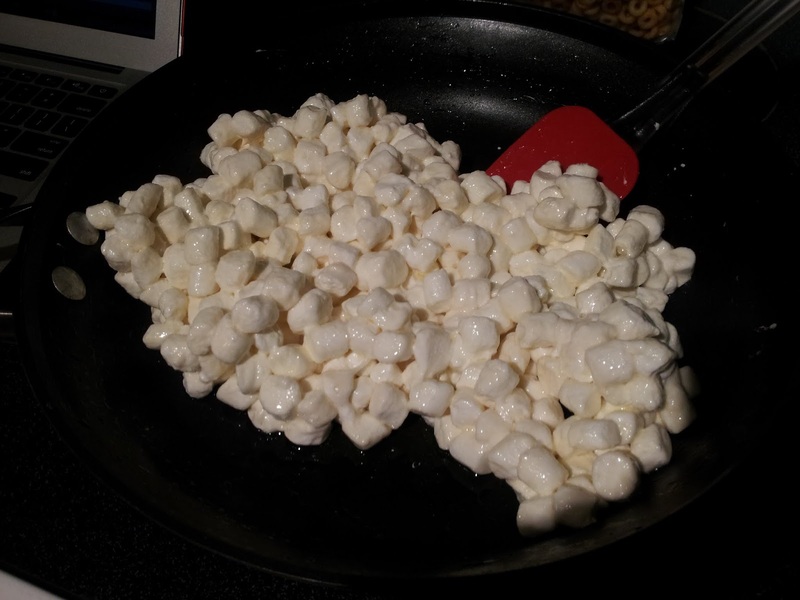 Melting marshmallows and butter together is relatively easy. The most difficult part of the whole process is being patient. You don't want to melt the marshmallows too quick or they'll turn almost rubbery, which is rather gross and useless. Slice up the butter into smaller chunks and melt it over low heat, either on a stove top in a large sauce pan, or in a microwavable bowl. I went for the stove top method. If microwaving, nuke the butter (and later marshmallows) in 15-30 second increments, stirring between zaps. 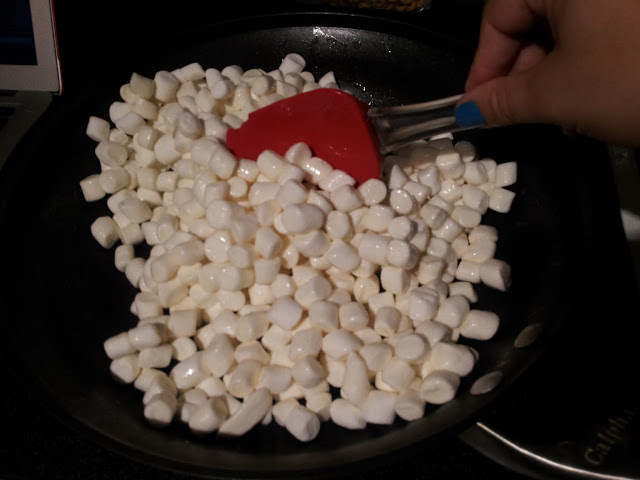 Once your butter is melted (like above), add your tsp of vanilla and pour in your bag of marshmallows. Use a stirring spatula (which I'm sure has a more correct name) to stir the marshmallows with the butter so that they're all evenly coated. Make sure you keep your heat set low! You don't need to mind the marshmallows very closely in the beginning, just make sure you flip the top to the bottom of the pan every 30 seconds or so. 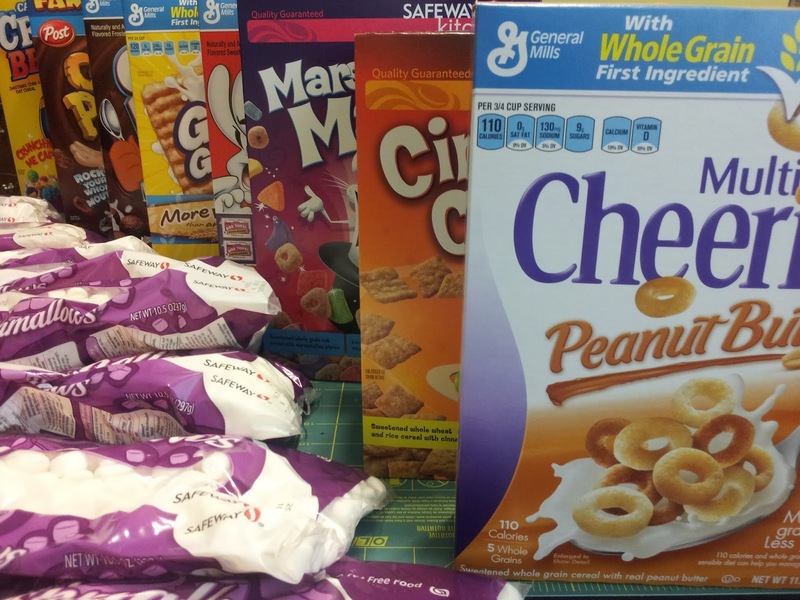 Take the down time to go ahead and unbox your cereal and open the bag. Once the 'mallows start clumping together like the start of a Stay Puff Man, you need to stir almost constantly, increasing in speed as you see fit. 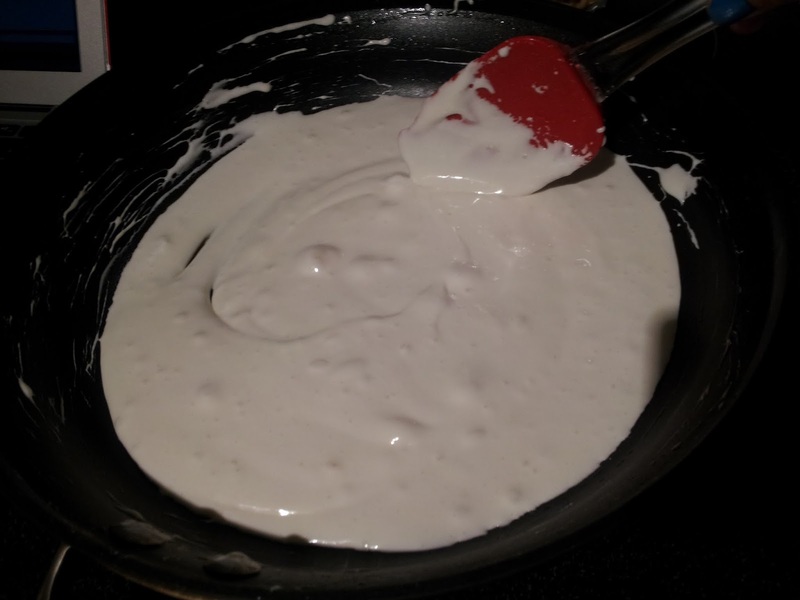 Remove your marshmallow goo from heat and start pouring in your cereal, about a 1/4 to a 1/3 of the bag at a time. You wanna make sure you stir the cereal in gradually to get all the pieces equally covered. 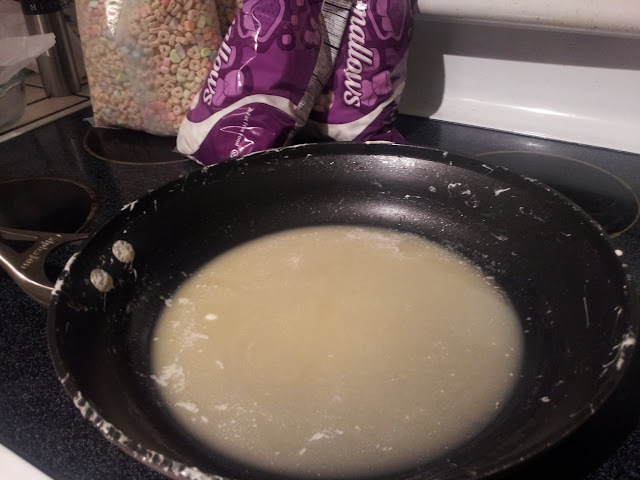 I find I like to "flip" the layer of cereals over in the 'mallow goo and expose "sticky" sides of what will eventually be a massive ball of cereal-marshmallow deliciousness. Notice in the next picture how the cereal below the freshly added layer is pretty much 100% coated in 'mallow. 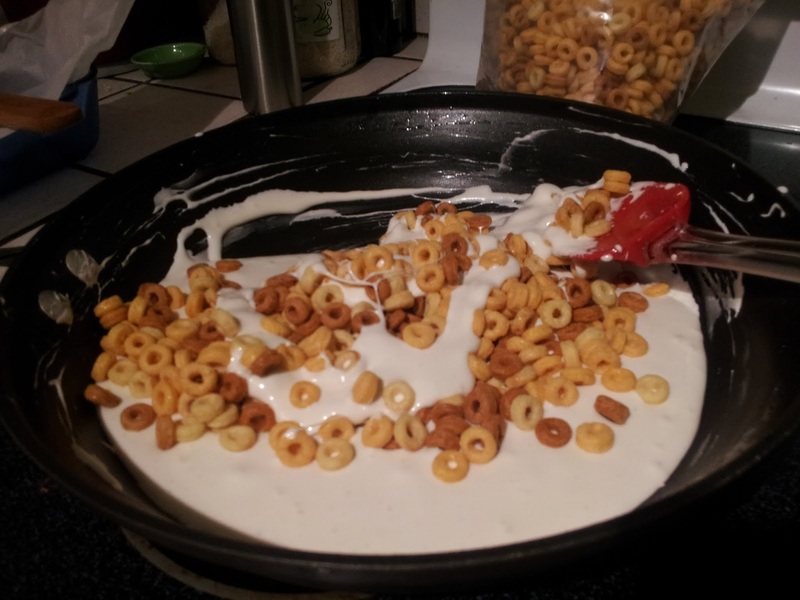 Once you get all your cereal added to the pan, you should find that you've got a lot less goo in the pan and a lot more marshmallow coated cereal. 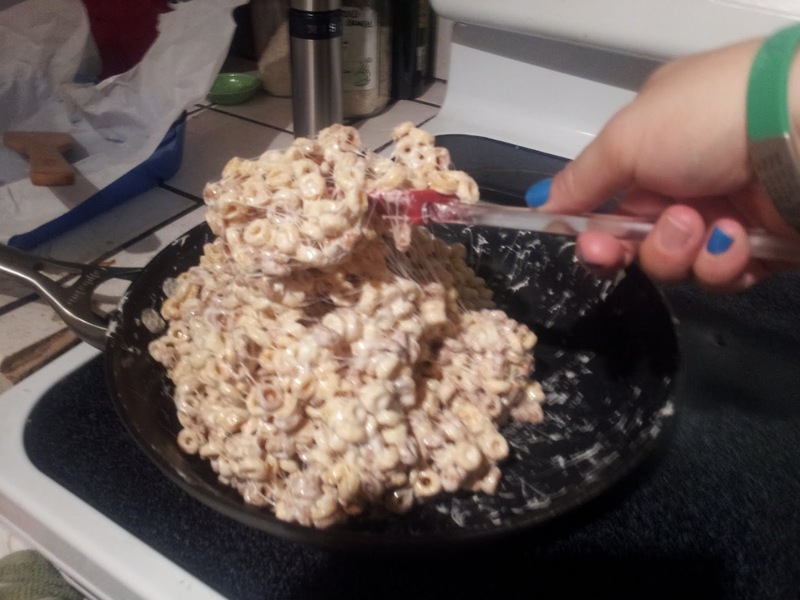 Make sure you rotate and flip the cereal around as much as you can to make sure you get all the marshmallow goo mixed in and all the loose cereal picked up by the mass. I like to pull up through the center of the ball to kinda stir it from within, like below. Righto! 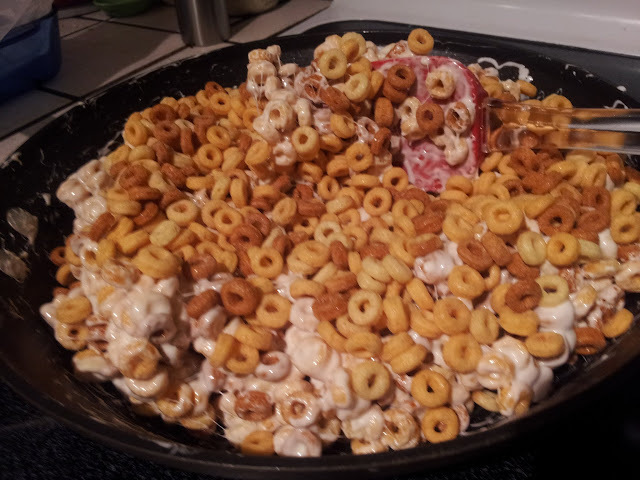 Once you've got all your cereal and goo mixed together, grab your parchment lined pan and blob that sucker right in. It's time for some shaping! For this step, I recommend scrapping off your spatula as much as you can and then coated in it a thin, if not unnoticeable layer of butter. It helps keep the goo from sticking to your utensil, which is VERY helpful. Once you've got your weapon of choice, start pushing and pressing the cereal blob into the corners and edges of your pan. Cereal change! Did ya notice? 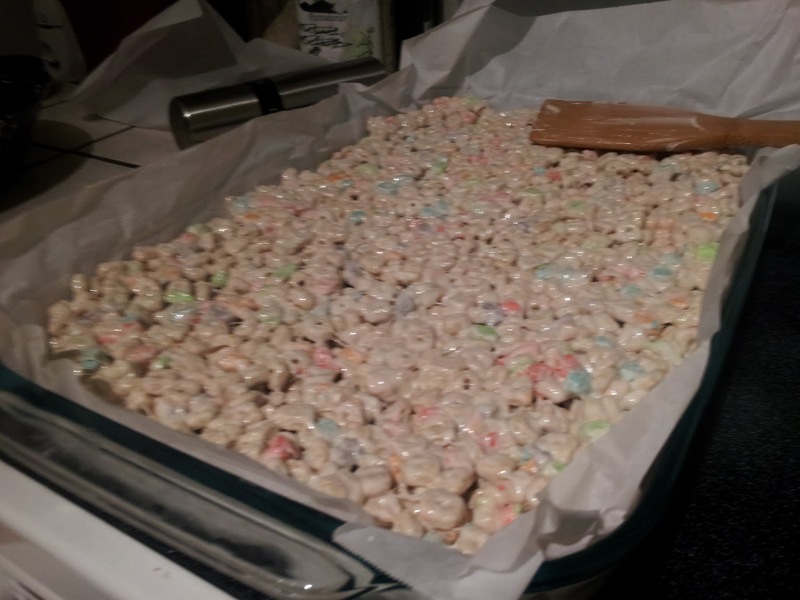 Once the marshmallow isn't crazy super zomg sticky, go ahead and pull the parchment paper out of the pan. 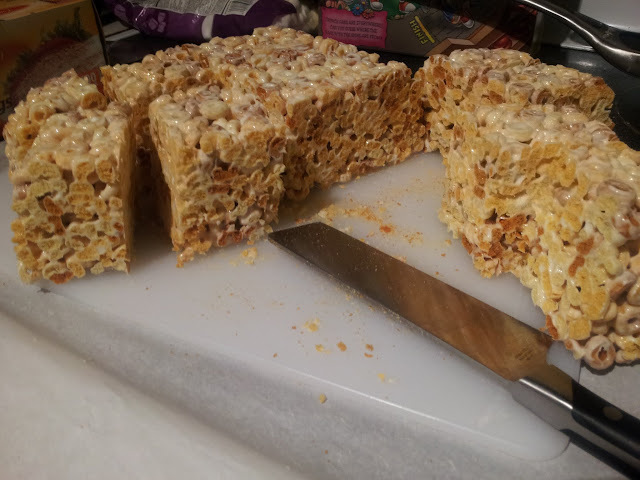 The sheet of cereal treats should peel easily from the paper, so go ahead and move it to a cutting board if you don't want to cut your parchment. Back to Peanut Butter Cheerios! Yay! 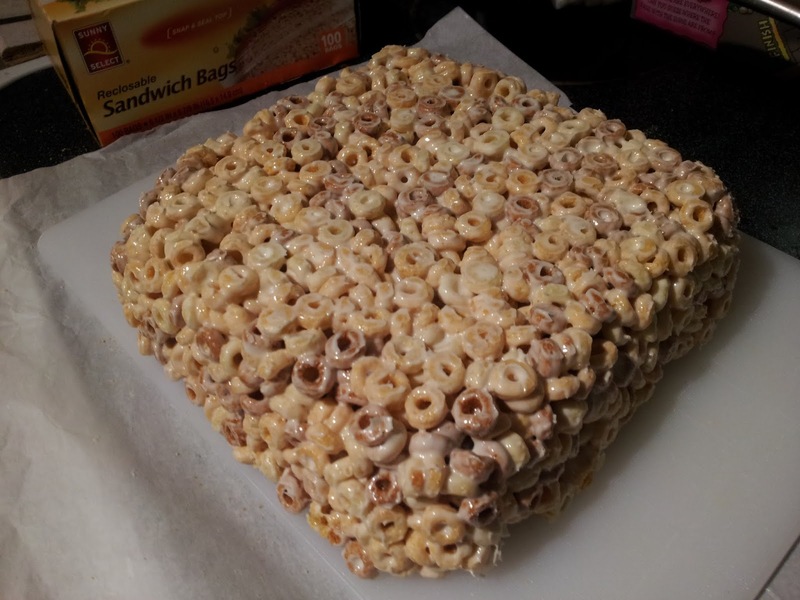 Figure out how big you want your Cereal Marshmallow Treats and go ahead and slice your sheet into pieces that size. The 9x9 pan I used for the Cheerios yielded me 12 very thick treats, which almost were reduced to 11 before I realized that might not be the healthiest dinner. So that's it. Easy Peasy. Feel free to expand and build from what I've provided here, just promise to let me know what you tried and how it turned out! Those look amazing! I wish I had been in the right place/time at PAX to get one of these scrumptious squares!